Meet Wisconsin's answer to the egg spoon. Before a recent bicycle camping trip in Minneapolis, Minnesota, the host promised a roaring campfire, good conversation, and pie irons. I’d never heard of a “pie iron” before, and I imagined some chimera of an anvil and round pie tin—perhaps a Dutch oven-like contraption that we’d throw in the fire for slow cooking. Think of it as occupying the middle of the “roughing it” spectrum between hot dogs on a shaved tree branch and freeze-dried packs of pad Thai. When I understood how to use the pie iron, I had one of those “Aha!” moments: I realized I could use them to make sandwiches (AKA “pudgie pies” locally), hand pies, casseroles, biscuits, and, really, any sort of dish that I dared fit into the pans. Here are some things to keep in mind when you embark on the road to pie iron mastery. Season them like you would a cast iron. Rome Industries is the biggest name in the American pie iron business, having manufactured them for camping stores since 1964. If you buy your pie irons new, make sure that you season them well to create a nonstick surface and prevent rust. You can season them just like you would any cast iron pan: with repeated oiling and baking over an open campfire or grill. That way, none of your camp snacks will stick to the pans. As with normal cast iron pans, the pie iron will get more and more seasoned with each use and will last for years. Prep your food before you start. When you pack for your trip, make sure that your ingredients are quick-cooking and already cut. You don’t want to do much food prep while camping, since that means you’ll have to bring extra cutting boards, knives, and bowls. So it helps to bring pre-shredded cheese, frozen waffles, chopped fruits and vegetables, canned biscuits, and meat that doesn’t need to cook over the fire. Naturally, many of the classic pie iron recipes incorporate Wisconsin cheese in some form. Keep in mind that you can use the pie iron for every meal—dessert included. Sandwiches are one of the ultimate platform foods, accommodating any kind of flavors and fillings you can imagine. So go with whatever you’d like, be it savory or sweet. Fill your waffle sandwich with bacon and hard-boiled egg or marshmallow fluff and raspberry jam! Make fancy Hot Pockets with crescent roll dough, brie, fig jam, and prosciutto! Grease the pans and get cooking. If you want to get really wild, Rome Industries and other pie iron manufacturers sell alternative models. Some are baguette-sized and made specifically for making breads. 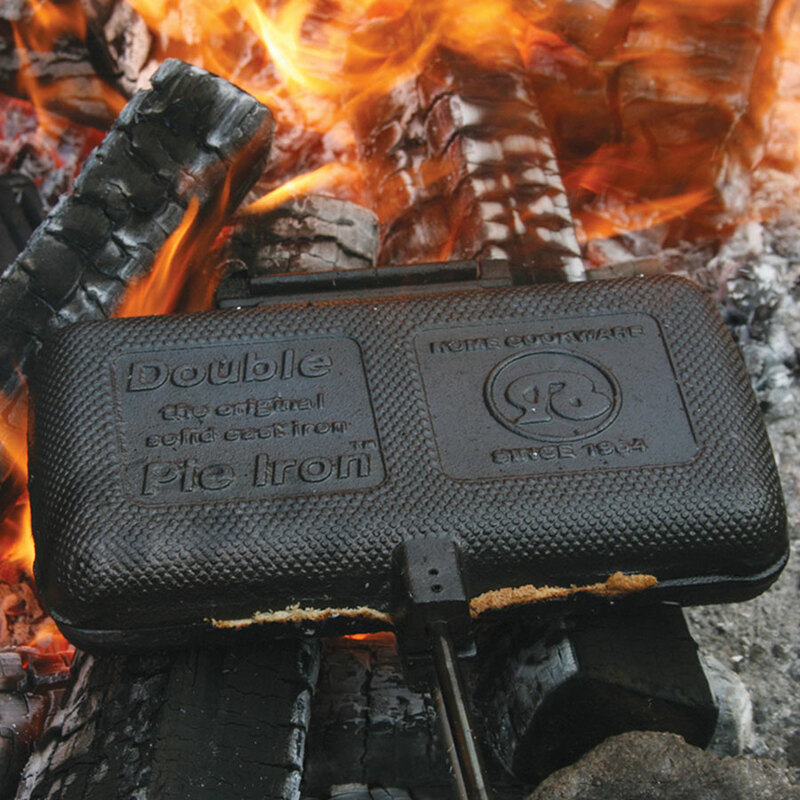 Others are double the size and heavier, so you can make even more ambitious campfire dishes. But bringing a whole bunch of those along might make your camping gear a bit too unwieldy if you plan to hike with them.